Happy New Year…again! 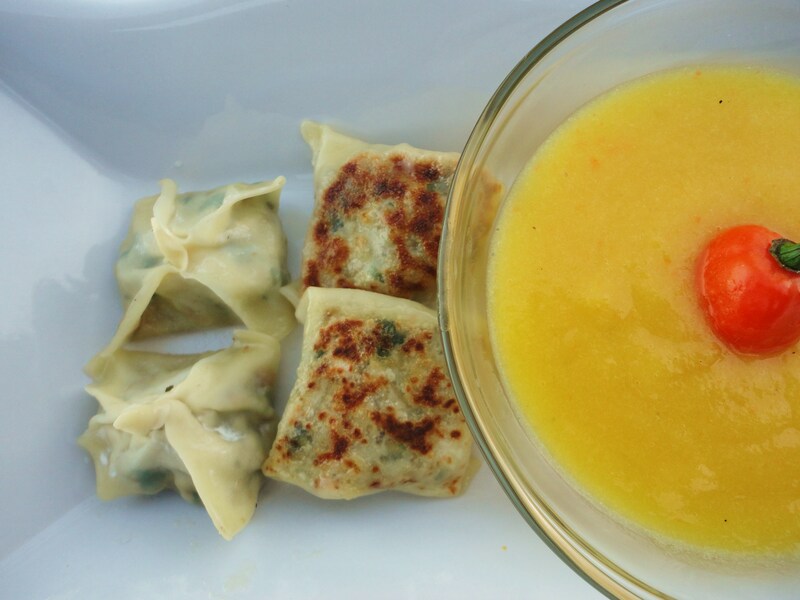 The Lunar New Year is upon us, and with it a chance to explore another culture as rich in traditions and foods as our own. The Chinese New Year is one of the most important traditional Chinese holidays and has always brought out our Chinese and Chinese-American brothers and sisters for a 15 day celebration of good luck, prosperity, health, fortune, and longevity. Chinatowns all over the world are alive, bustling places of business, food, community and culture. Here in Los Angeles, Chinatown shares a storied past and border with Olvera Street. Here is your chance to rediscover Chinatown and Los Angeles. This weekend we’ll be attending the 113th Annual Golden Dragon Parade & Chinese New Year Festival. To help you celebrate we’ve included a quick recipe for our version of chicken and mushroom wontons with a spicy Habanero and mango dipping sauce. In a blender/food processor, add the mango, Habanero, ginger, rice vinegar, lime juice, lime zest, orange juice and purée until smooth. Season with salt and pepper to taste. If it is too thick add a little water. 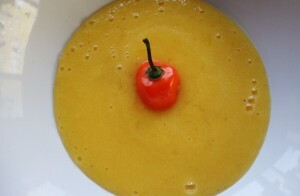 The citrus, depending on the quality, might need to be toned down a bit by adding some sugar to balance out the sauce. I ended up using about 1 tbspn. 1 bunch spinach, rinsed, trimmed and patted dry. 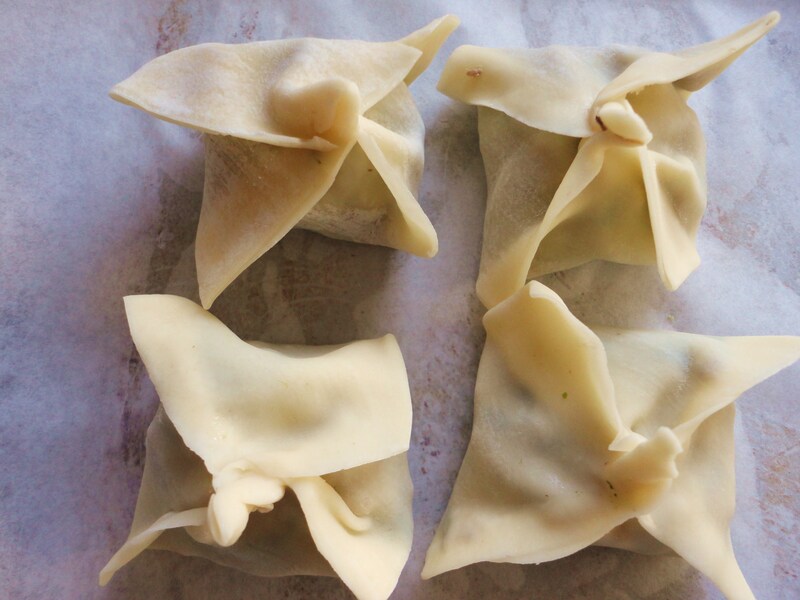 Now for the fun part: Working in batches, lay out your wonton wrappers on a clean flat surface. Place about 1 tbspn of the chicken and mushroom filling in the center. Using a clean pastry brush, lightly brush the edges with water. Gather the four corners in a point and gently twist and pinch the corners shut. 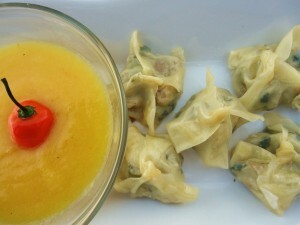 Then go back and seal the rest of the wonton so none of the filling can seep out during the cooking process. Place on a baking sheet and make the other 29 or so. 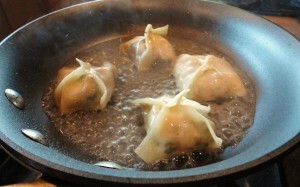 In a large skillet/wok, heat about ½ tsp of oil and place your wontons in, careful not to crowd the pan. 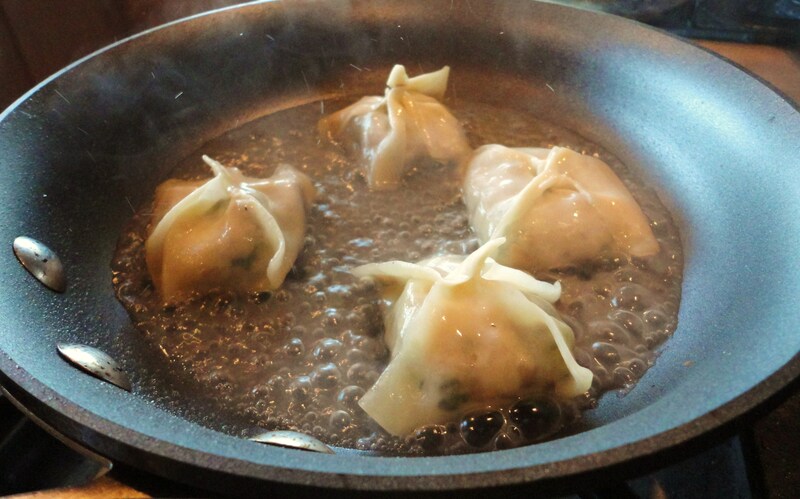 Once they’ve developed a nice golden brown crust on the bottom, carefully pour water into the pan (just enough to barely cover the bottom of the wontons, about ¼ inch or so. Cover to steam for a few minutes and then let the liquid cook out. You’ll probably have to do this in batches so make sure to wipe down your pan between each batch with a paper towel. 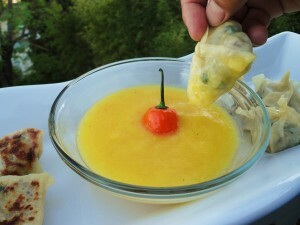 Serve with the Spicy Habanero and Mango dipping sauce and enjoy with a nice cold Chinese beer. Place two sauce pans of a similar size on your stove top. your family and try out some new dishes.